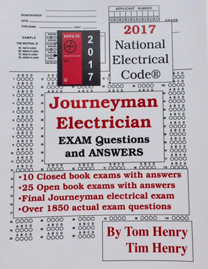 The 2017 Journeyman Electrician Exam Questions and Answers workbook contains 10 closed-book exams, a 50 question true or false exam, 24 open-book exams, and a 3 Hour 80 question Final Exam! Over 1850 exam questions with answers & Code References. 332 pages total! You will also need to study other books on Calculations, Ohm's Law, Theory, etc. in your proper preparation for the electrical examination. Item #102-17 2017 Journeyman Electrician Exam Questions and Answers Over 1800 exam questions with answers & Code references. Code Electrical Classes Inc. offers a 2 Day Electrical Seminar's (click here) to prepare the Journeyman and Master electrician for the electrical exam. Classes start at 8 am on Saturday and Sunday.